The genteel streets of Elsternwick are not usually the scenes of a protest but on Saturday, more than 150 disgruntled residents, many with children in tow, marched with placards. The rally was to highlight the community’s opposition to two apartment towers of 10 and 14 storeys proposed after supermarket giant Woolworths bought the site of the former ABC studios. While resident action groups are not new, their prevalence, profile and role in Melbourne has grown as the city’s population has boomed. Social media has been harnessed to raise awareness, attract new members, co-ordinate campaigns and share information. In Brunswick in the inner north, an established and well-organised action group with more than 1000 members is gearing up for the eighth day of hearings at the state’s planning tribunal. Protect Park Street Precinct formed two years ago in response to the proposed 13-storey development of 333 apartments overlooking Princes Park. The application has since been revised to 14 storeys, 255 apartments and 12 townhouses. To date, the group has raised more than $100,000 to mount a comprehensive legal case against the large legal team hired by developer JW Land Group, which paid $32 million for the site. Members include former La Trobe University chancellor Professor Adrienne E Clarke, who said the group wanted to see “an appropriate building, respectful of heritage values” on the site. The rise of resident groups has seen thousands of Melburnians, many with little or no experience in politics or lobbying, become resolute activists in recent years. “I don’t think it’s any secret that the way the planning scheme operates at the moment tends to be quite pro-development and favours the big end of town,” says Glen McCallum, the president of Protect Fitzroy North, a powerful group that campaigned against a sprawling 16-storey apartment complex on Queens Parade proposed by developer Tim Gurner. In that case, planning minister Richard Wynne controversially intervened to place a 10-storey limit on the site, which ultimately led to the project being greatly scaled back. Mr Gurner defended the project at the state’s planning tribunal and welcomed the approval when it was granted. Since then, Mr McCallum’s organisation has offered assistance and fielded enquiries from resident groups in Collingwood, Alphington, Ivanhoe, Heidelberg and Brunswick. With or without the support of councils – many of which have been inundated with development applications and are simultaneously juggling dozens of proposals and appeals – resident action groups are regularly taking on multi-millionaire developers in the Victorian Civil and Administrative Tribunal. When a case reaches the tribunal, developers will often hire high-flying legal teams consisting of a QC, a junior barrister, several solicitors and a stream of other consultants and experts. Meanwhile, residents may not have any legal representation or, if they have successfully fundraised, may hire a planning barrister like Daniel Epstein, who charges community groups a reduced fee. Most resident groups vehemently reject the NIMBY label, and Mr Epstein agreed it was not the right description. He stressed that the dozen groups he had worked with were not anti-development, but against developments that were ill-considered or too large. Those involved in planning disputes say it is arduous work entailing countless hours of research. 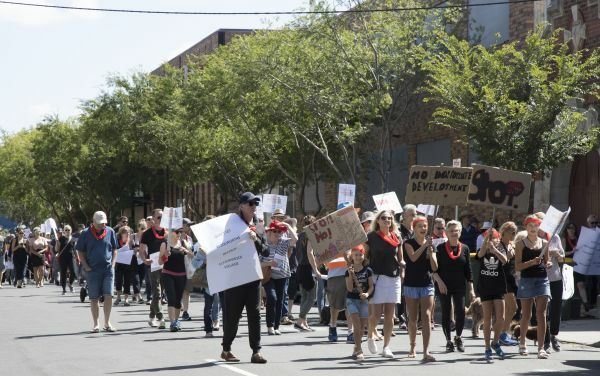 “Our little structure plan for Elsternwick had approximately 19 documents, over 1000 pages,” said research scientist Jacinta Smith, who attended Saturday’s march. Glen Eira council will hand down its decision regarding the Woolworths development next month. Great to see residents out in force. Pity that council doesn’t support them with decent planning. This will end up at vcat and will be interesting to see whether council uses some second rate planning officer or spends some dough on decent qc representation. Now just watch how hell bent the right wingers like Hyams, Magee and Esacoff will be in punishing this revolt of the ungrateful residents. They’ll rick their backs shooting their arms up so fast to vote yes. Reckon you’re wrong. They’ll vote against in the face of all this resident opposition. Nothing to lose as they know it will end up at vcat. 100% they’ll vote against it. But….they have just endorsed the structure plan with discretionary controls so ultimately they have already approved it. Our wonderful Councillors love waisting our money and saving face so better that VCAT is seen to approve it. Your all joking the developers will put it ambit claim for 22 floors, the councillors will approve 18 or 20, saying it to risky to to take it to VCAT because the developer will place revised application to VCAT asking for 25. They vote yes on this ruse all the time, how on earth do you think all this inappropriate developments you see got out there. Boroondara Council committed to positive preservation of the suburb of Canterbury. There is a thorough study to be carried out of about 400 residences and recommendations for their preservation as well as the recommendations off the study are to be sent to Mr Wynne.